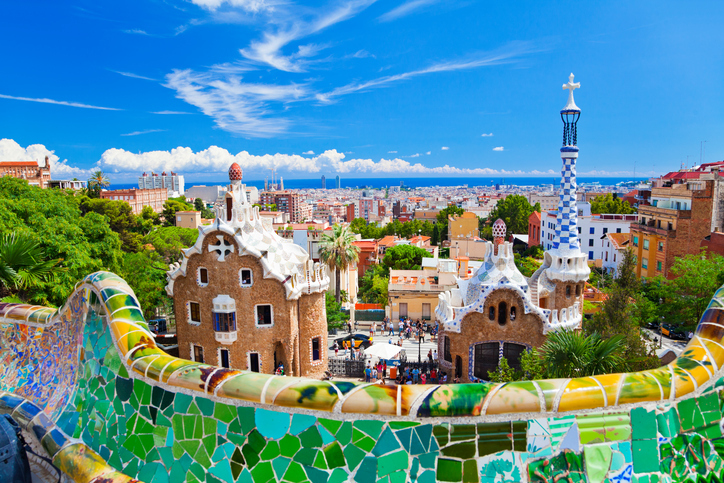 Spain is a firm favourite with British holidaymakers thanks to great beaches, excellent weather and quality food but there’s so much more to one of Europe’s top travel destinations than lounging by the pool. A rich cultural heritage, excellent gastronomic scene and some of the world’s finest architecture is all readily available throughout Spain in its magnificent cities – but which is the best for a city break? Famous for iconic architecture, excellent food and pulsing nightlife, Barcelona is a vibrant seaside city packed with excitement. 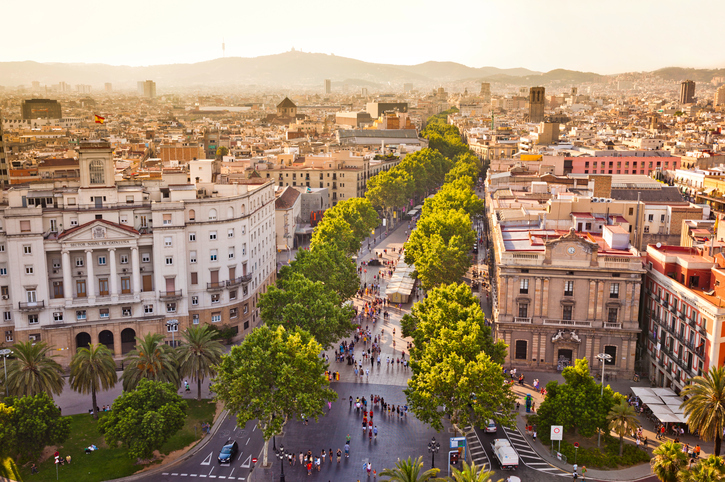 La Rambla is the city’s beating heart, filled with restaurants, shops and entertainers. Head through La Rambla to the must-see medieval Gothic Quarter, which brims with beautiful churches, narrow streets and grand, palm-tree filled plazas. No visit to Barcelona would be complete without visiting Gaudi’s famous La Sagrada Familia Basilica. The masterpiece has been under construction since 1882 and is not expected to be completed until 2041. Airport: The Barcelona–El Prat Airport is 8 miles from the city centre. Dramatic Toledo is a diverse and compelling city, home to some of Spain’s finest monuments. It was known as the ‘city of three cultures’ in the Middle Ages when Muslim, Christian and Jewish communities lived peacefully together for centuries behind its impressive city walls. The result of this rich multicultural heritage is a treasure chest of an old town full of churches, palaces, fortresses, mosques and synagogues, earning it the reputation of an open air museum and a UNESCO Heritage Site award in 1986. 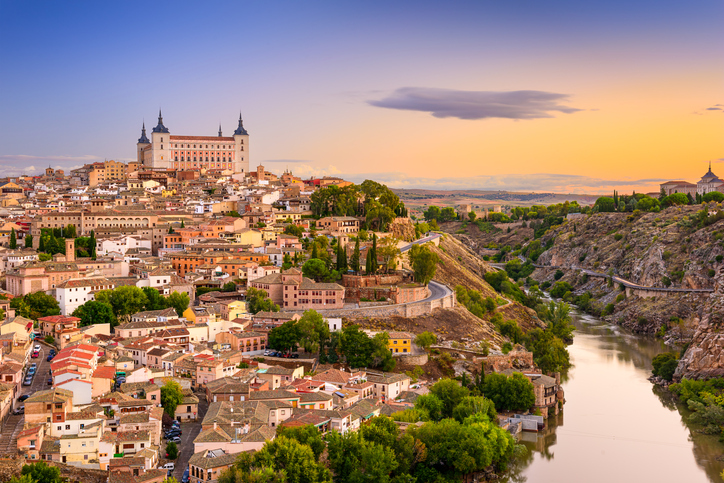 Surrounded by the River Tajo on three sides, Toledo sits atop a gorge and is small enough to explore on foot, although one of the best ways to discover the city is to wander aimlessly around the city’s medieval streets while seeking out the works of famous artist, El Greco. Airport: Barajas Airport in Madrid is 48 miles away and well connected by Spain’s high speed trains. 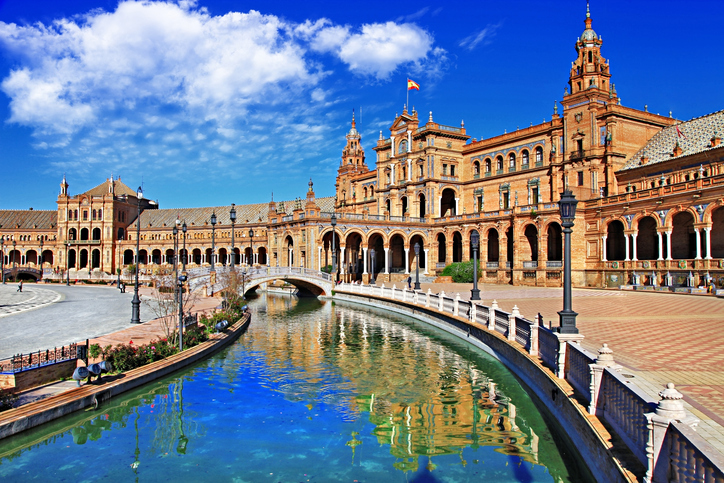 The sultry city of Seville is known as the frying pan of Spain, but a cool city vibe, Moorish architecture and ancient streets make it a perfect city to explore over a few days. The capital of Andalusia is famous for its flamenco, tapas bars and orange trees – the fragrance of which hang in the air. To further indulge the senses there’s the excellent Cathedral of Saint Mary, Plaza de Espana, the Alcázar palace as well as the Jewish Quarter of Santa Cruz, a beautifully preserved Jewish District. Airport: Seville International Airport is 7 miles from the city centre. 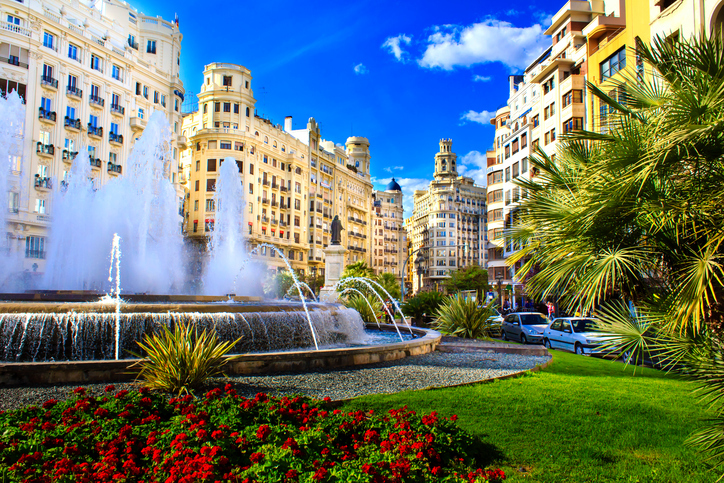 Valencia has so much to offer, from fabulous Modernist architecture and elegant art nouveau buildings to great museums and a characterful old quarter. History lovers and culture vultures can head to the UNESCO- listed La Lonja de la Seda (Silk Exchange), the Valencia and Mercado Cathedrals and the Museo de Bellas Artes. Gourmet cuisine is one of the great pleasures of Valencia, with long lunches and dinners a must. 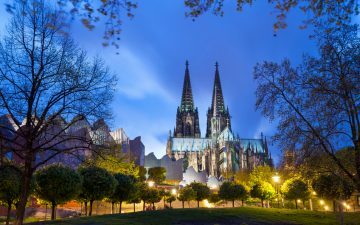 The coastal city is surrounded by fertile, fruit-and-vegetable growing farmlands and is famed for its rice dishes like paella; but its dining and nightlife scene offers plenty more. Airport: Valencia’s Manises Airport is 5 miles from the city centre. 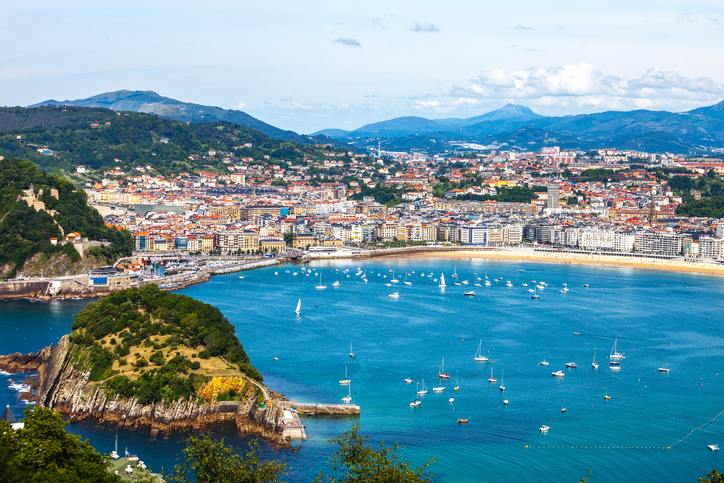 San Sebastian is one of Spain’s more trendy destinations attracting film buffs, beach-lovers, jazz fans and foodies alike. 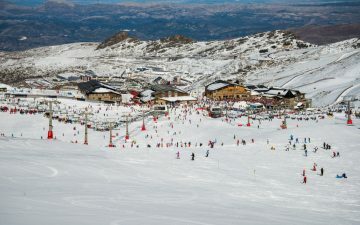 The city, which lies in northern Spain’s Basque region is a cultural heavyweight, hosting internationally-acclaimed film and jazz festivals including the Heineken Jazzaldia, which brings some of the jazz’s biggest stars to one of Europe’s oldest jazz festivals. For anyone who likes to indulge in sumptuous dining experiences while holidaying, San Sebastian is arguably Europe’s premier food destination and frequently comes out top on lists of the world’s best places to eat. Michelin-starred restaurants abound and for more humble flavours, make sure you try its famous pintxos (tapas). For one of the best city beaches in Europe, head to the laid-back Playa de la Concha, while Playa de Gros is a livelier option and great for surfers. Airport: Biarritz Airport (France) is 29 miles from the city centre. Salamanca is considered to be one of the most beautiful cities in Spain with an old town listed as a UNESCO World Heritage Site and an exceptional Plaza Mayor regarded as one of the country’s most elegant city squares. The Plaza is illuminated at night, making it one of the city’s more unforgettable highlights. 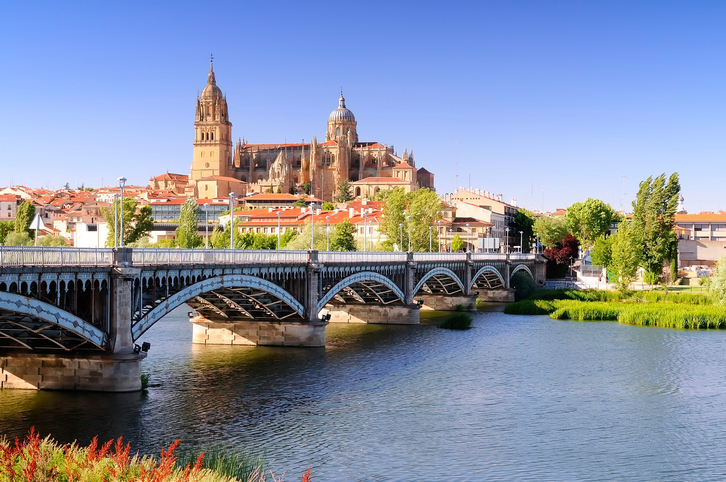 Salamanca has a huge student population that keeps the city buzzing with a youthful energy. The renowned university, which is thought to be the third oldest in Europe, was founded in 1218 and is well worth a visit. It is one of the many architectural wonders built from local sandstone which over the years have acquired a soft glow, giving rise to Salamanca’s moniker: the ‘Golden City’. For one of the city’s most iconic views, head to the Patio Chico, where you can see both the old and new cathedrals of Salamanca. Airport: Valladolid Airport is 78 miles to the city centre. 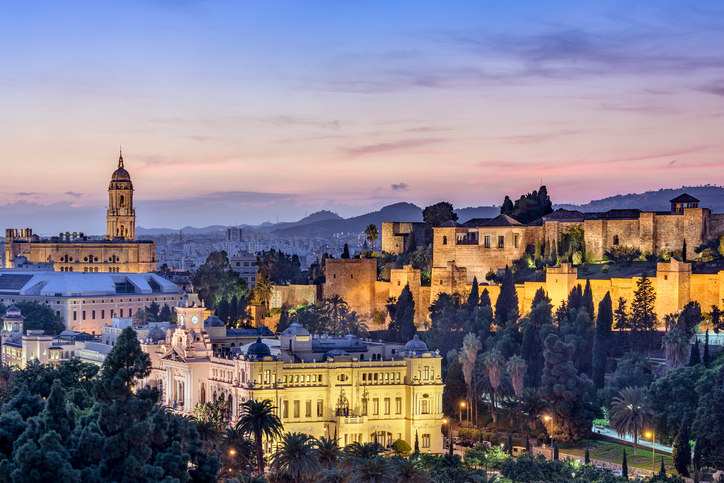 Malaga is a stunning, arty and culturally rich city you won’t want to miss. 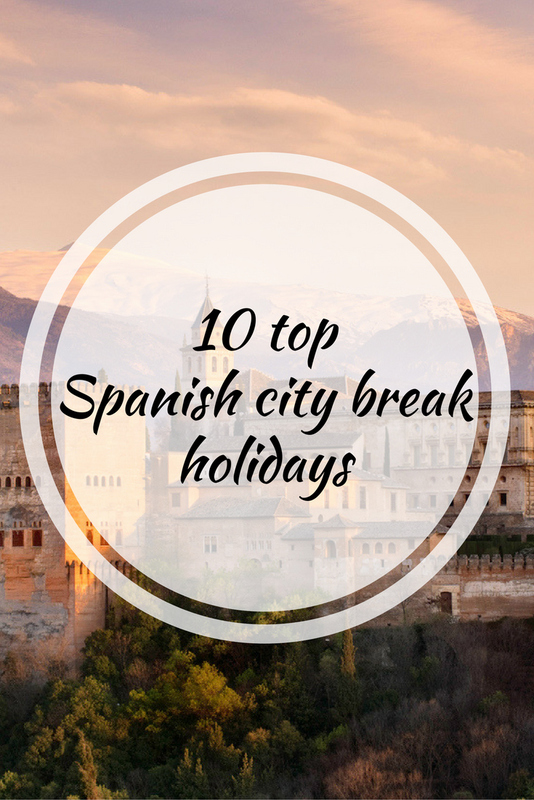 Packed with museums, theatres and monuments to discover including the remains of a Roman amphitheatre, the 1,000-year-old Gibralfaro castle, 13th century Alcazaba as well as several art museums dedicated to the city’s most famous son: Pablo Picasso. Wander around the atmospheric, pedestrianised historic centre and stop off at the stunning cathedral or amble through the historical botanical gardens before heading to one of the many sumptuous tapas bars. For a bit of retail therapy, head to one of Spain’s most elegant shopping streets, the marble-lined Calle Marques de Larios which is worth a visit for the architecture alone. Airport: Malaga Airport is 5 miles away from the city centre. 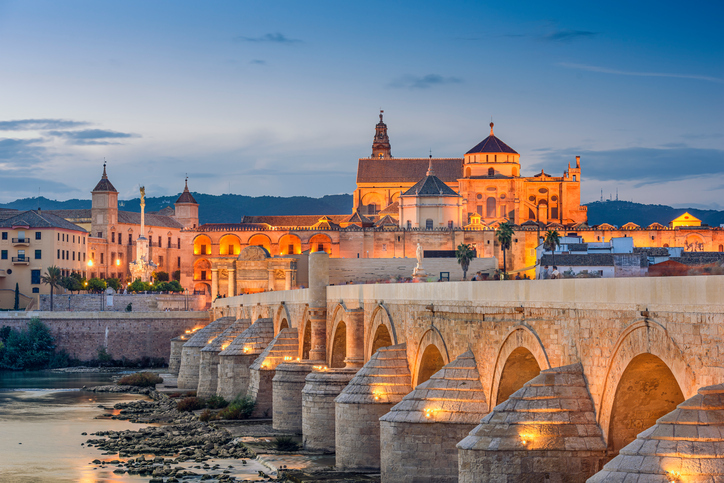 One of the greatest cities of the medieval world, Cordoba was the capital of the Muslim occupied Iberian Peninsula and home to one of the grandest mosques in the western world – the magnificent Mezquita of Cordoba. The Mezquita is a widely regarded as one of the world’s greatest pieces of Islamic architecture, made more exceptional by the cathedral which was built at its heart many years after the Christian conquest of the city in 1236. The city is perfect for those who like to explore on foot or by bike as the narrow streets surrounding the Mezquita are filled with beautiful plazas, narrow side-streets and bustling tapas bars and old, moody wine bars. Airport: The nearest airport is in Seville, 82 miles away. 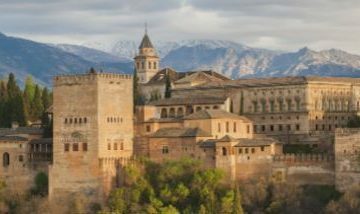 Granada, the final stronghold of the Islamic occupation in Spain, has a fascinating blend of Moorish and Spanish heritage. 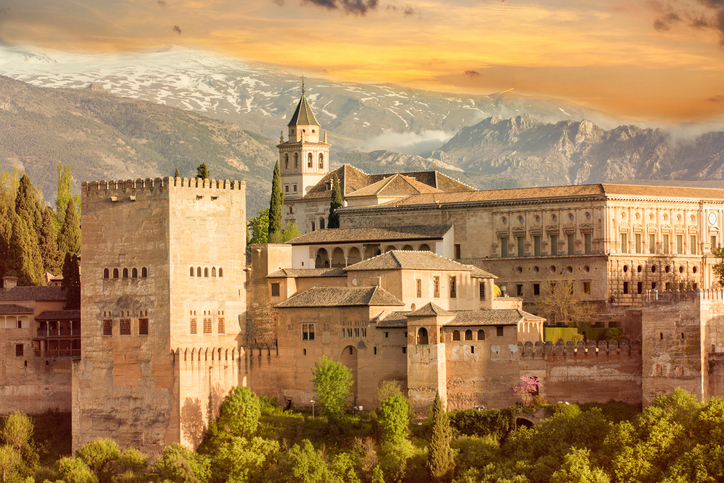 Set against the backdrop of the snow-capped Sierra Nevada mountain range and boasting an Arabic quarter, a stunning old town filled with authentic flamenco shows as well as Spain’s most visited building, the Alhambra Palace, this Andalusian city is breathtaking. Romantics can enjoy watching the sun set over the Alhambra Palace from the Mirador de San Nicolas in the Albaicin Quarter. After exploring the maze-like streets, head to one of the bustling bars where the tapas are still free; a must for foodies. Airport: The Federico García Lorca Granada-Jaen Airport is 12 miles away from the city centre. Santiago has one of the most magnificent old towns in Europe, with a labyrinth of cobble stone streets laced with gothic buildings galore which are, according to locals, at their best when it rains. 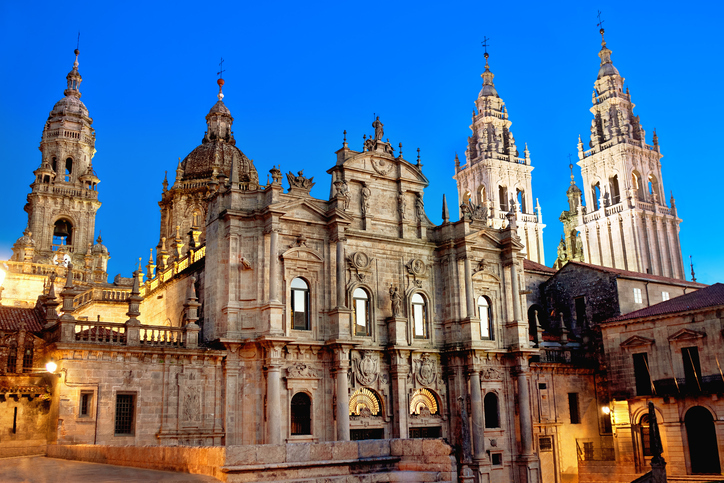 Galicia’s capital is the final stop in the Camino de Santiago pilgrimage, also known in the UK as the Way of St. James, but a more sedate stroll is recommended, as the medieval streets take on an old world vibe after dark. Head to the Rua do Franco towards the cathedral for a wonderful dining experience; the tapas bars and taverns here are legendary. “Galician-style octopus” goes down very nicely with the local Albariño wine. Airport: Santiago’s International Airport is 15 miles to the city centre. 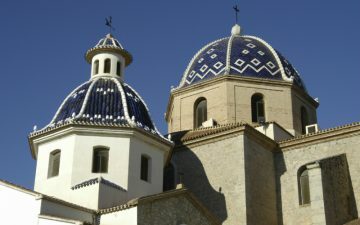 When planning your trip to Spain, look into holiday cover for Spain.